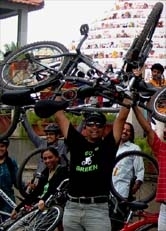 Go Green Campaign Ride - 06 Sep 2009 towards Cubbon park - GGI-Group size: 4000+ Professionals, Increasing on day to day basis, Come & join us 2 serve Mother Nature. 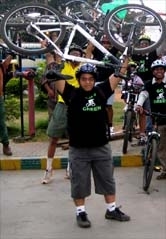 Started by 6:45am and reached cubbonpark by 7:20am. 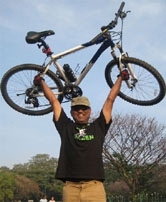 As soon as we entered cubbon park we noticed 3 cyclist riding with a low saddles, noticed tobe newbies to cycling, met them introduced our Go Green awareness and they loved to be part of the group meanwhile Vasantkumar did introduced 3 more newbies into the group. total it was a pleasant ride that we did had this Sunday and hopefully looking forward to have all these people on board ASAP. Jaynagar 4th Block - Jnagar 3rd block - Ashoka Pillar - Siddhya Road- Lalbagh Rear Gate - Lalbagh Main Gate - Minerva Circle - Hudson Circle - Cubbon Park - City Libarary - Bangalore Press Club.